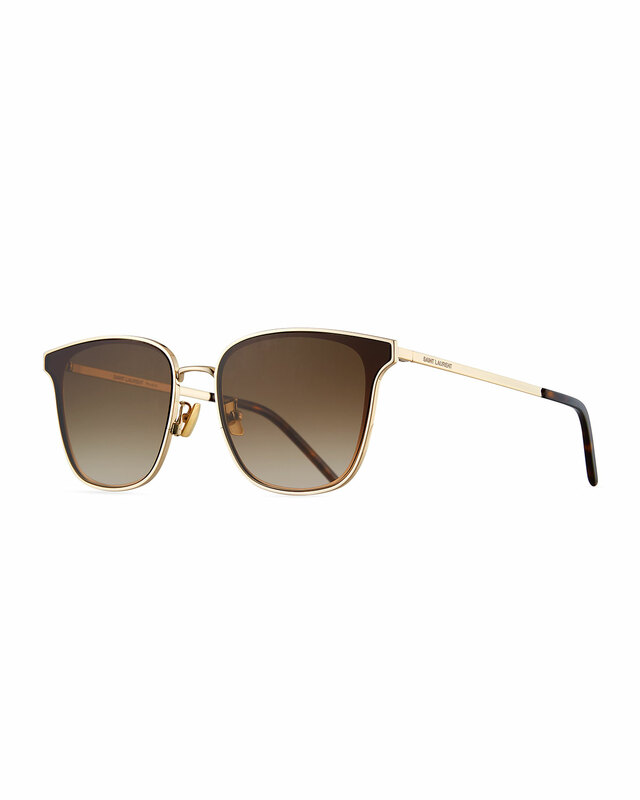 Saint Laurent “SL272” soft rectangular sunglasses. Metal inlays at logo-engraved temples. Frames are compatible with prescription lenses. Metal-frame aviator-style sunglasses in silver-tone. Top bar. Transparent rubber nose pads. Blue lenses with 100% UV protection. Metal-frame aviator-style overlay at face. Acetate temple tips in black. Aviator-style stainless steel-frame sunglasses in silver-tone. Top bar. Khaki flat tinted lenses with 100% UV protection. Transparent rubber nose pads. Transparent acetate temple tips. Round stainless steel-frame sunglasses in silver-tone. Top bar. Black flat lenses with 100% UV protection. Transparent rubber nose pads. Transparent acetate temple tips in grey. Round titanium-frame sunglasses in matte black. Tonal lenses with 100% UV protection. Transparent rubber nose pads. Transparent acetate temple tips in grey. Aviator-style stainless steel-frame sunglasses in silver-tone. Top bar. Tonal flat mirrored lenses with 100% UV protection. Transparent rubber nose pads. Transparent acetate temple tips. Sculpted stainless steel and monel-frame sunglasses in silver-tone. Top bar. Blue lenses with 100% UV protection. Transparent rubber nose pads. Sculpted temples. Transparent acetate temple tips.